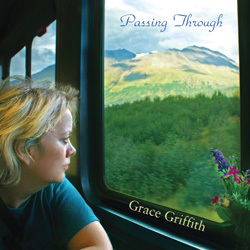 Album Review: Grace Griffith, "Passing Through"
This is not a typical album review; this is special. Grace Griffith is a Washington D.C.-based singer; a performer in the folk tradition – specifically Irish folk – and vocal footsteps of someone as legendary and wonderful as Sandy Denny. She has been a professional physical therapist and a touring coffeehouse performer and recording artist. However, what makes Grace Griffith’s album something to sit up and take notice of, besides the quality of the execution and the material, is the story behind its recording. In 1998, Ms. Griffith was diagnosed with early-onset Parkinson’s Disease, which is a degenerative neurological condition – it affects movement, speech, etc. (my father suffered with this amongst several other illnesses, so I am all too familiar with it – and as most people are aware, Michael J. Fox has it and is a spokesman/fund raiser). It has prohibited her from playing guitar; it has affected her voice and her ability to perform and yet, she still manages to do so out of love for what she brings to the audience and listener. In listening to Passing Through, which took two years to record, you can put aside knowing that Ms. Griffith recorded this with so much difficulty facing her – the musical arrangements are lush, dark, haunting and her voice sounds unscathed – warm, embracing, enticing and filled with richness. From the opening cut, “Brigid’s Shield” to the acoustic beauty of “Nature Boy” (yes, THAT “Nature Boy” – the Nat King Cole song which was performed by Alex Chilton and William Eggleston on Big Star 3rd) to “Down By The Salley Gardens” (based on the Yeats poem), this is a singer who brings everything to her performances – gentility, emotion and passion. This album is worth its salt – and not because of how it came about or the story behind Ms. Griffith. Of equal note, since it is still early July, there will be a tribute concert to Grace Griffith held on Sunday, July 20th, 7:30 p.m. at the Birchmere Music Hall in Alexandria, Virginia. You can find information or buy tickets by using the link below. In the meantime, introduce yourself to Grace Griffith’s music.